Good news, we followed the map and found the buried treasure. 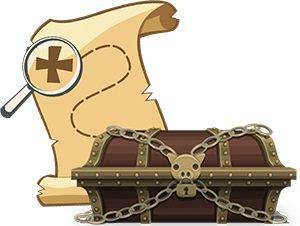 Creak….. We’re opening the lid of the treasure chest right now. Gasp! What’s inside? Submit a comment to this blog by Tuesday, November 27, to let us know what you hope to see in there. One lucky teacher will win our mystery prize. Good luck! Here are some gems we’ve run across for you this week; take a look! The Follett Challenge is now open. You could win a share of $200,000 in Follett products and services, and your school could get a visit from Newbery medalist Kwame Alexander. The program is open to schools that are getting students engaged in learning in creative ways. To get the details on how to enter, visit FollettChallenge.com. The third week in November is Geography Awareness Week. Get ready with free activities from the US Census Bureau. Don’t miss “Scavenger Hunt: Where Is Gina the Geographer?” and “Getting to Know Your Neighbor.” Click here. What do your young students want to be when they grow up? 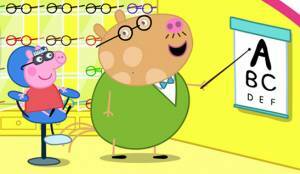 Open their eyes to lots of possibilities with help from Peppa Pig. Download free activities and enter for chance to win Peppa Pig educational merchandise and an Amazon gift card for school supplies. It’s oinktastic! Click here. I sure hope our mystery prize is just what you were hoping for! Maybe a classroom set of books? Oh I hope its’ a vacation to an island. Need a break and some sunshine to regroup! A gift basket full of books and little treasures!!! All sorts of school supplies. Fun pens, colored pencils, markers, and craft items. Gift card for a coffee shop! Books or school supplies would be great. A free year’s subscription to Mailbox Gold. Classroom supplies such as glue sticks, watercolor paint, markers, and colored pencils. A gift card to Starbucks, Amazon or Mailbox. One of those timers for our classrooms! What’s inside? An extra hour a day so that I can get done what needs to get done? Well, if I can’t have that then I guess something fun for the kiddos – books, or a new game that we can play together. I would like to see every book ever written by Dr. Seuss and about Dr. Seuss (Theodor Seuss Geisel). Glue sticks! We can never have too many of those – I think our classroom pet must eat them at night….lol! I hope it is more books and/ or materials for my preschoolers! Oh, the possibilities are endless! Anything would be a welcome surprise but some felt tip pens/ flair markers do make me happy! My classroom is filled with books but a few more are always welcomed by my first graders. Coffee and chocolate are welcomed by me, of course! Dry erase markers…..maybe the lids can reattach themselves…..
Any gift is a treasure, but learning centers would be marvelous! I’d love to see a world globe! What a treasure that would be for my public library! Mahalo for the creative contest. I hope to see and win helpful classroom tools, magnetic. letters, stickers, books, flair pens, dry erase markers, glue sticks… etc. So exciting!! !